My husband was horrified when I said I was going to pickle a couple of the beautiful peaches we got from Gunkel Orchards. The peaches we found while driving through eastern Washington were the most delicious peaches either of us had ever eaten, and it did seem a shame to alter them in any way. I have to admit that, until fairly recently, I haven’t been a fan of pickles either. The exception was my adopted Grandma Gail’s sweet bread and butter pickles, which were like candy to me. 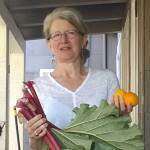 Now, it seems, everywhere you go there is a lovely side of pickled vegetables tucked beside soft boiled eggs, avocado toast, cheese plates, and burgers. Pickles are particularly good with rich foods, and add sparkle to a plate both visually and gustatorily. It is the sugar in the pickling brine that makes all the difference. Without the sugar the sharpness of the vinegar is not pleasing to me. Once there is sugar involved, pickling fruit is not such a stretch. The flavor of these peaches is pretty intense. I wouldn’t suggest sitting down to a bowl full. 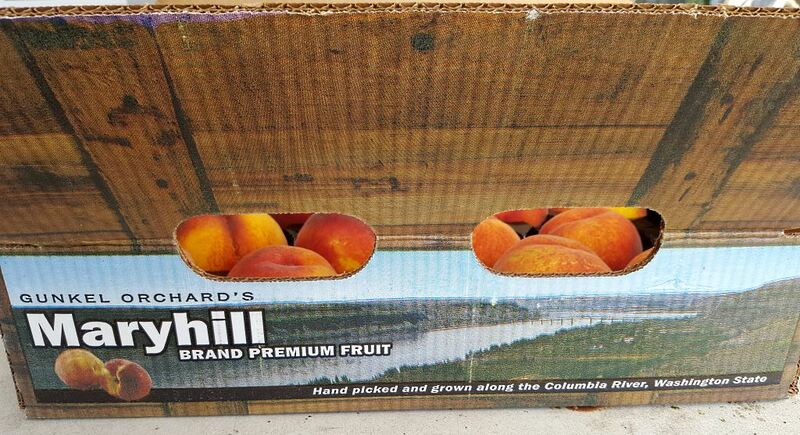 My challenge was figuring out a way to present the peaches in a way that would win over my husband. I don’t like to lose a wager, and I didn’t want to be the person who wasted our perfect peaches on an experiment gone wrong. 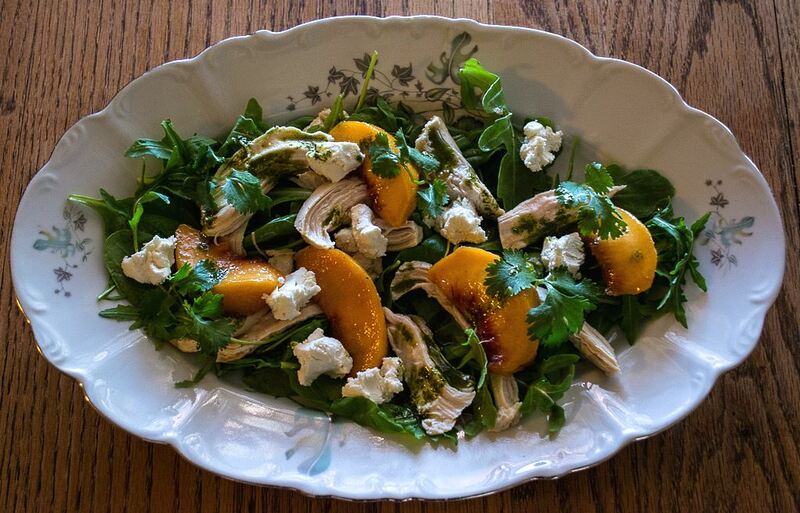 I decided to slip the pickled peaches into an herb salad with poached chicken, goat cheese and a basil vinaigrette. (I whisked basil oil together with the pickling brine for the dressing. The approximate ratio was 3 tablespoons brine to 1/3 cup oil, but I go by taste rather than measurement.) Add salt if necessary. I can say with confidence that we are converted to the wonders of pickled peaches. Peace is restored. And now I’m ready to slice some of these beauties on top of vanilla ice cream. Combine the vinegar, sugar and all of the spices and salt in a saucepan. Bring the mixture to a boil, and simmer until the sugar has dissolved. 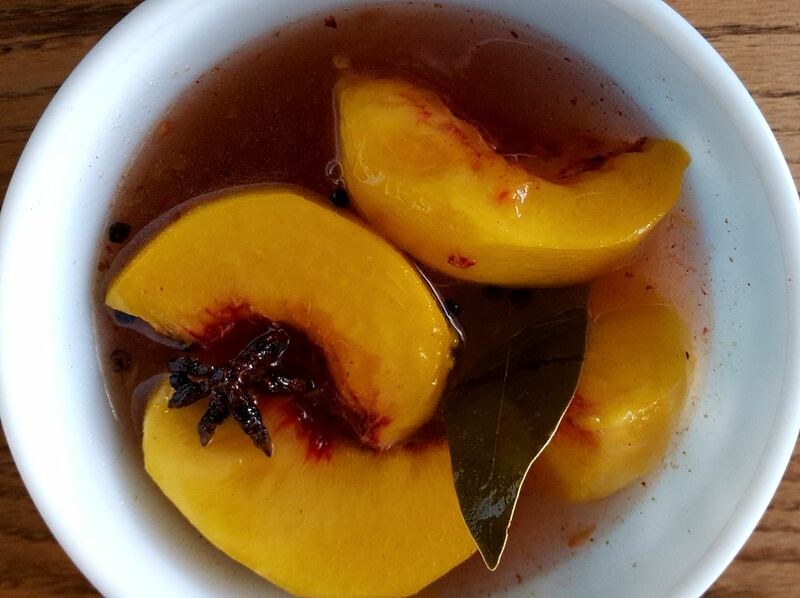 Place the peaches in a clean bowl or canning jar and then pour the hot pickling brine over the fruit to cover completely. Cover the container and refrigerate for at least a week before serving. They will be good for up to a month if kept in the refrigerator. Note: You can, of course, play around with the spices. Allspice, clove, juniper berry, cardamom—whatever you like, whatever you have in your cupboard. 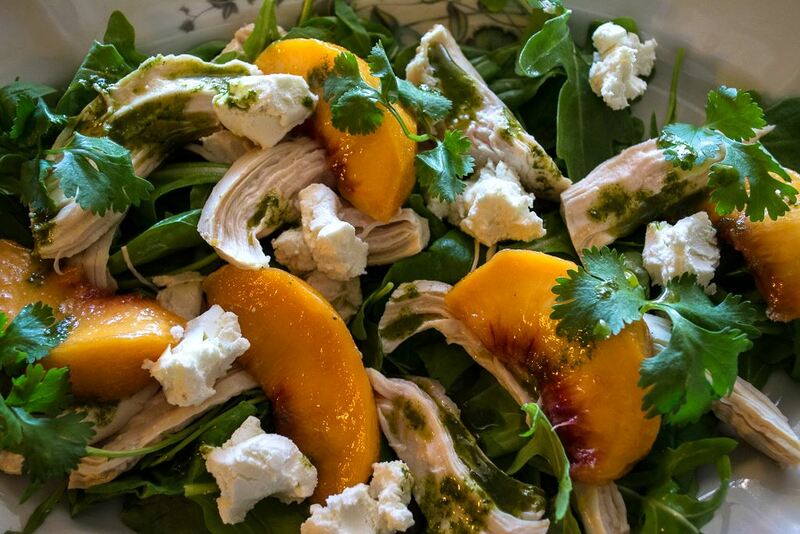 The peaches hold their own with the addition of spicy peppers, too.